I found the article below which is an excerpt from a book called Manual Training For The Rural Schools. It was published in 1916 and as the title says was for rural schools to use as instruction for shop class. The book has a very quick how to and then goes into a few projects. What struck me about this was the fact that shop class has pretty much left us now and it was nice to look back at how thing were. This book is way before my or probably anyone reading this, but more than likely in your own childhood shop class was there and important for all of us. 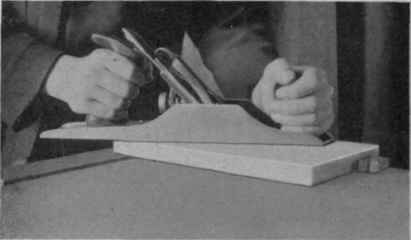 1 – Plane one side smooth and mark “I.” Call this side the “working face.” Fig. 1. Fig. 1. Holding Wood Between Bench Pegs and Planing Surface. 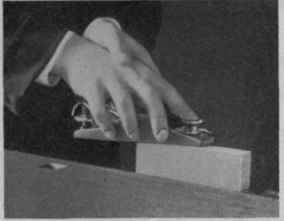 2 – Plane one adjoining edge at right angles to surface “I” and mark “II.” Call this edge the working edge. Fig. 2. 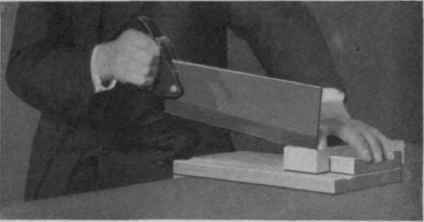 3 – Draw a line across surface “I” near one end at right angles to surface “II,” and remove the end stock to line with saw or plane. Mark end surface “III.” Call this end the working end. Fig. 3, Fig. 4. Fig. 3. Squaring the End withTry Squareand Pencil. 4 – Measure off the length of the required piece on surface “I” from the end surface “III,” and reduce stock to length with saw or plane. Fig. 4. Fig. 4. Sawing Cross Grain onBench Hookwith Back or Handy Saw. Fig. 4a. End Planing with a Block Plane. 4a – The end may be trimmed with a block plane as shown. Fig. 4a. 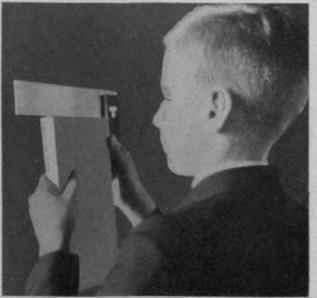 5 – Measure off the width of the required piece on surface “I” from edge “II” and remove stock to line with plane. 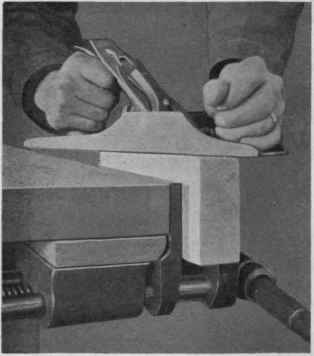 6 – With marking gauge set at the thickness of the required piece, measure off the thickness of the required stock from surface “I” and remove stock to line with plane. Fig. 5. Fig. 5. 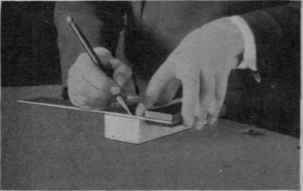 The Marking Gauge in Use. Fig. 6. Testing to See if End is Square with the Edge. 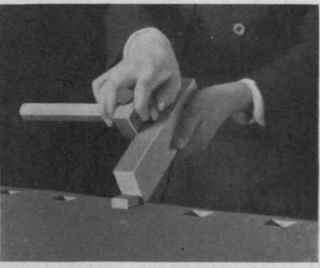 6 – In reducing a piece of wood to dimensions the try square should be used constantly, to obtain right angles with the adjoining surfaces. The stock should be removed to the line but the line should never be cut away. Fig. 6. Good article Chris. I remember my shop class days. This also reminds me of a Popular Mechanics magazine PDF I found awhile back online. There wew a lot of woodworking articles in it. It was dated from around this time.